If you look at a map, you can see that there is a railway line that goes directly east from Redhill to Tonbridge and Ashford - a dead straight line that looks as if it is going somewhere in a hurry. This is the line that passes Edenbridge, Penshurst and Leigh on the way to Tonbridge, and such stations as Paddock Wood, Staplehurst, Headcorn and Pluckley between there and Ashford. While the section between Redhill and Tonbridge might seem like a branch line these days, this was a major trunk route in the first two decades of the railways. It was in fact the original route of the South Eastern Railway, whose aim was to reach the channel port of Dover. Created by an Act of Parliament in 1836, the South Eastern had initially hoped to extend the London & Greenwich Railway (see Beginnings) to Chatham and Dover - the normal stagecoach route - but the Admiralty blocked this on the grounds that a railway tunnel under the Greenwich Royal Observatory might disturb its instruments. The SER's next plan was for a line a branching off the London & Croydon Railway towards Oxted and Tonbridge. But instead it was forced by parliament to share the route of the London & Brighton Railway, then being planned, as far as Redhill. Parliament's reasoning was that only one southern route out of the capital was necessary, thus showing a lack of foresight in transport planning it has displayed ever since. The joint route did allow the two companies to share construction costs, but it resulted in an awkward arrangement whereby the London & Brighton owned the track from Croydon to Mertsham, while the SER owned it from there to Redhill. This was later to cause a good deal of conflict - see Bitter Competition - and its benefits. This indirect route meant the line to Dover was 20 miles longer than the stagecoach route - quite a handicap in the days when trains only travelled at 30 miles per hour. The route explains why Tonbridge station is aligned from east to west, not north to south as one might expect when taking a train to Hastings, and explains why to this day there are trains from London Bridge to Tonbridge via East Croydon and Redhill. 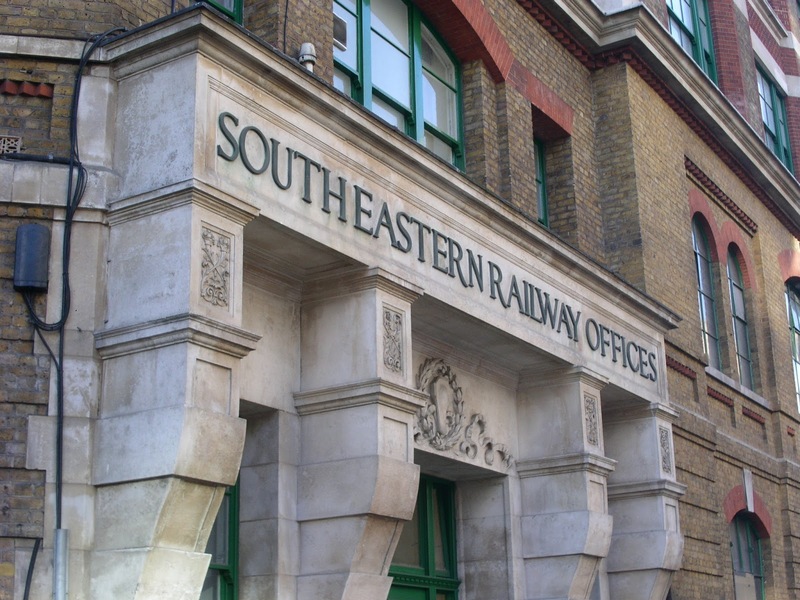 It was only in 2009 that this service was transferred from the Southeastern to the Southern franchise. The energy of those early Victorian railway builders was amazing, and construction started on the entire line from Redhill to Dover all at the same time. Even as they were building the easy straight stretch east from Redhill, they were also tunnelling through the cliffs near Dover. Remember that this was in the era before mechanical diggers when all railway lines were built with pick and shovel by 'navvies' (an abbreviation of navigator - a term originally used for the labourers who built the canals). These hard working and hard drinking men must have been absolutely terrifying to the rural communities they passed through. Equally, environmental standards were not what they are today. On the Folkestone to Dover section, where the soft chalk rock was already easy to cut through, the engineers were not above blowing up inconvenient sections of cliff. They did this at a point near where Samphire Hoe is now and simply let the tide wash the rock debris away. As it turned out there was a price to pay for this seafront route, as this section of the line has always been subject to landslips and sea damage. It was closed for that reason from 1915 to 1919 (most inconveniently, as this was the First World War when the railways to the Channel Ports were in heavy use) and also for nine months in 2016. The line opened to Tonbridge and Ashford in 1842 (the station buildings at Pluckley are the original ones from this era) with Folkestone following in 1843 and Dover in 1844. There were eight trains a day and they took 3 hours 5 minutes to Dover, an average speed of 29.6 miles per hour. The port was then, as now, the most important starting point for cross-channel ferries and this was a time when tourism was developing as rich Victorians discovered the continent. The SER's station, Dover Town, could not have been more convenient, being right on the dockside (it closed in 1914 and there are now only faint traces of it). The company also built a grand hotel next door - the Lord Warden, which opened in 1853. The following year Admiralty Pier, a new stone jetty, was inaugurated by the government. This enabled cross-channel paddle steamers to dock in Dover at all stages of the tide, when previously passengers had often had to be rowed to shore. By 1860 the SER line was running right onto the pier and travellers could step off its trains straight onto the ship. 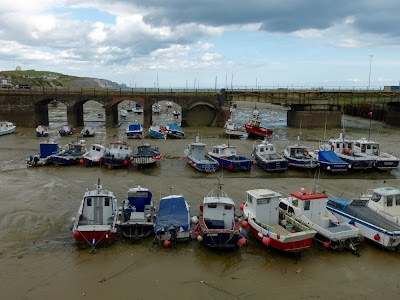 When the railway reached Folkestone in 1843 the company started ferry services from Folkestone to Boulogne, and by 1848 there were two sailings a day, with the first recorded day trip from London to Boulogne taking place in 1849. The first day trip from London to Paris was the following year, with a travel time of ten hours thirty minutes in each direction. 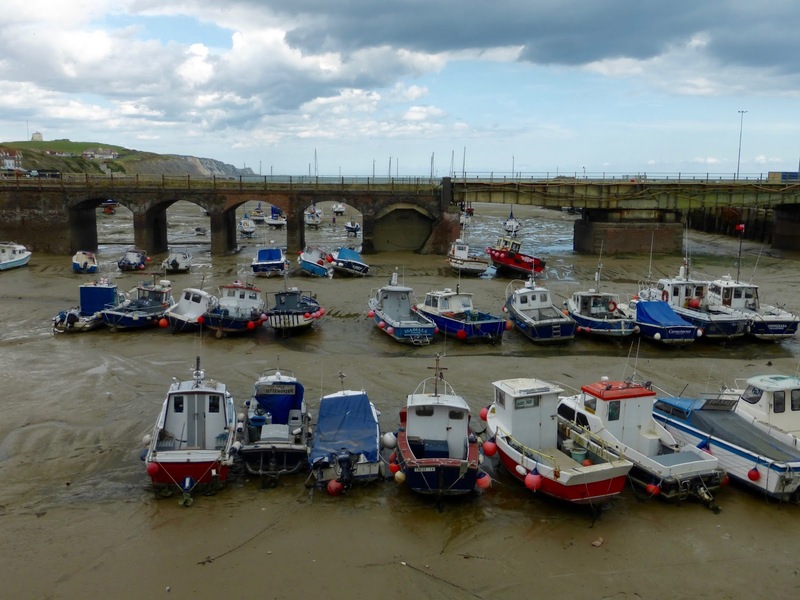 By 1854 three times as many cross-channel passengers were using Folkestone as Dover. Helping this was the fact that that Boulogne had a much more direct rail route to Paris than Calais, a situation that did not change until a line was built between the two French towns in 1867. The original station in Folkestone was some way to the east of the current ones, just before the tunnel. A steep line opened from here down to the harbour in 1844, with a Folkestone Harbour station opening in 1849. The original Folkestone station became Folkestone Junction the following year. For the next 150 years boat trains would chug up the incline, helped by several banking engines in the steam era, and reverse direction onto the main line just beyond the station. The later history of the Folkestone stations is explained in Bitter competition - and its benefits but Folkestone Junction lived on until 1965 and its platforms can still be seen. Railway involvement in cross-channel ferries was to last until 1984, when British Rail's Sealink subsidiary was sold off by the Thatcher government. Privately-owned ferry services continued to operate out of Folkestone after this date, but they ceased in 2000. The last scheduled trains on the harbour branch ran the following year, though the line was not formally closed until 2015. Both the track and harbour station then remained intact until 2017 but are now being redeveloped, though in a way that looks likely to retain at least some elements of the railway heritage. Back in the 1840s, once Dover had been reached the South Eastern started building branches. The line was extended from Ashford to Wye, Chilham and Canterbury (the current Canterbury West station) and on to Ramsgate and Margate by 1846. A branch from this line curved off from Minster, just beyond Canterbury, to Sandwich and Deal (in those days still an important port for sailing ships) by 1847 - though it was not till 1881 that this line was extended around to Dover. On the other side of its territory, the SER struck a line south from Tonbridge (a town then called Tunbridge: the spelling was changed in 1893 to avoid confusion with Tunbridge Wells, which developed as a spa town in the 18th century. Modern pronunciation often incorrectly follows the new spelling). This line reached Tunbridge Wells in 1846, Frant, Wadhurst, Stonegate (then known as Ticehurst Road) and Robertsbridge in 1851, and Battle and Hastings in 1852. The previous year the line from Ashford to Hastings (the one which serves Rye) had also opened. So this early in the railway boom, Hastings already had lines in three directions, the other one (the first to be opened) being the one to Brighton (see From London Bridge to the sea). Interestingly, once again the SER did not get its chosen route, which would have struck south from Headcorn to Tenterden and on to Hastings from there. The justification here was that Tenterden was one of the largest towns in Kent at the time. The company was to have another attempt at this route when they opened a Paddock Wood to Hawkhurst line in 1883. This did not get to Tenterden either, and it was not until 1900 that the town was reached via Robertsbridge by the Kent & East Sussex Railway (see Lines we lost for more on these routes). It is for this reason that Tenterden is today a relatively quiet leafy town. Incidentally, in another example of Victorian railway contractors cutting corners in order to build quickly, on the line from Tunbridge Wells to Hasting the builder saved money by lining the tunnel with three layers of bricks rather than the seven specified. By the time this was discovered it was too late to do much about it except add the extra four layers on top. Very early on the South Eastern also built a line that today seems like a rather quaint little branch line but originally had an important purpose. This line ran from Paddock Wood to Maidstone, opening in 1844 and forming that town’s only railway link for the next 30 years. In 1856 it was extended to Strood (a station at that time named Rochester). On this line are Yalding, Snodland and Cuxton. The SER had already approached Strood from another angle, having absorbed the London & Greenwich Railway (see Beginnings) in 1845. (Technically it just leased its lines, and the company remained in existence, collecting the rent, until 1923.) The hills around Greenwich blocked further progress however, and so instead a line (the North Kent Line) was opened from a junction near London Bridge to Lewisham, Dartford, Gravesend and Strood in 1849. Greenwich remained a terminus until 1878, when the Admiralty finally relented and let the SER build the Maze Hill tunnel linking it to Woolwich and beyond. One other useful line for walkers that we owe to the South Eastern Railway is the one that goes to Dorking and Gomshall. Opened in 1849 as the nominally independent Reading, Guildford & Reigate Railway, it was in fact always operated by the SER and was bought by them in 1852. Its aim was to provide a link between the Great Western Railway and the Channel Ports. In the 1850s the SER ran through trains from London to Reading on the route, via Redhill, Guildford, Farnborough, Sandhurst and Wokingham, which must have ranked as one of the more indirect rail routes in the south east. Right into the 1960s special summer holiday trains continued to run by this route to the resort towns of the south coast, and today the line fulfils a similar role by providing a link between Great Western services to Reading and flights out of Gatwick. Incidentally, the station now known as Dorking West on this line was the original Dorking station: the one now known as Dorking Deepdene was added in 1851 under the name of Box Hill. Later, in 1867, the line from Leatherhead to Dorking was built (see Lines we lost), and the current Box Hill station was opened, known for much of its life as Box Hill and Burford Bridge. 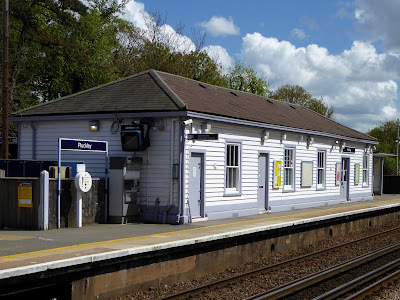 For the next 56 years, therefore, there were two Box Hill stations, until in 1923 the newly-created Southern Railways renamed the original one to avoid confusion. There were also two stations named Dorking throughout this period (the original one and one on the Leatherhead line). Again it was Southern in 1923 that decided to distinguish between them. It named the original station Dorking Town, and the Leatherhead line one Dorking North. In 1968 British Rail renamed Dorking North as plain Dorking (the name it still has today), while Dorking Town became Dorking West in 1987.